Want to get your kids to eat something they wouldn’t normally eat? Have a cool backstory. Seriously. My kids were not really interested in eating this dish until I told the backstory, then they couldn’t get enough. So, what’s the back story? We need to go back in time to the Napoleonic Wars. In 1800, First Consul Napoleon Bonaparte had just barely eeked out a victory over the Austrians at Marengo in Italy. This victory helped to solidify the new French government’s position in France after the Revolution. Legend has it, Napoleon asked his chef, Dinand, to make a meal to celebrate the victory. According to the lore, the Austrians had captured the food supplies of Napoleon’s army, so there was precious little in the way of food available to cook for such a meal. Not even butter!! Quelle horreur!! So, Dinand dispatch people into the Italian countryside to find something, anything, to put together a dinner for Napoleon. They came back with a chicken, olive oil, a few mushrooms, tomatoes, eggs and crawfish fished from a local river. Dinand added some bread rations, some staples he had handly (garlic, onions) and a bit of cognac from Napoleon’s flask, and voila! Chicken Marengo is born, June 14, 1800! 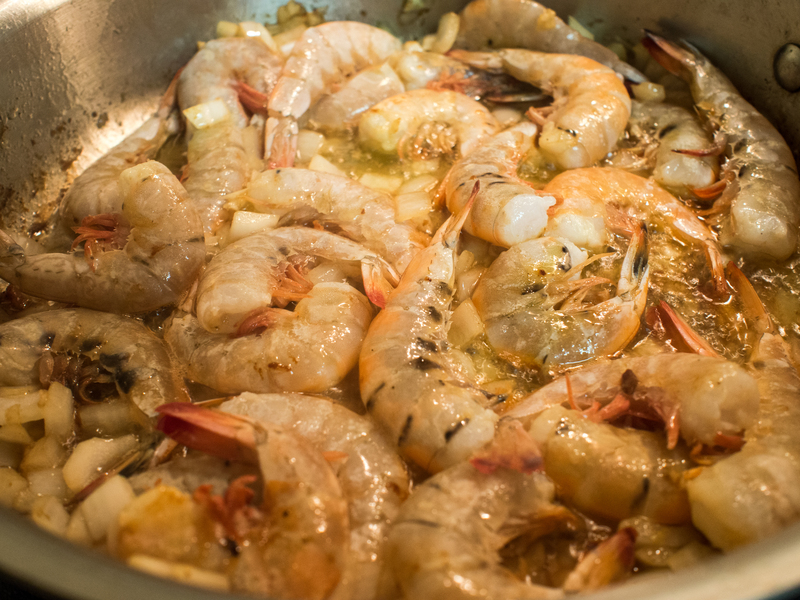 Upon returning to Paris, legend has it Dinand attempted to “correct” the recipe by using white wine instead of cognac and omitting the crawfish. Napoleon sent it back instructing the Chef that the dish is to be made the original way. No deviation. Napoleon was very superstitious and considered this dish his victory dish. Now, who wouldn’t want to eat, or at least try a dish with such a storied history?!? Eating the dish Napoleon ate? There are very few things in history you can recreate and have the same experience. What I love is that food is one of them. Some things might change a bit, like the breed of the chicken, but it’s still pretty close. You get a window into the times and how people (mainly the well to do) lived. 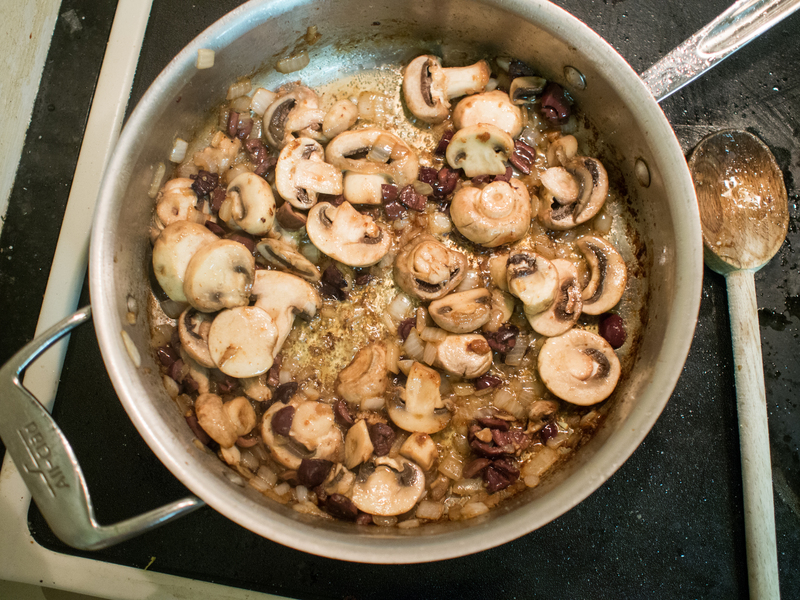 Chicken Marengo over the years has been “modernized”. One cookbook from the late 1800s called for making the dish with half a pound of truffles!! Well, that wasn’t happening on my blog budget. So, I tried to stick to the original. I actually had most of the ingredients, save the crawfish. I substituted shrimp. I added juniper berries (you can substitute a bay leaf) because I thought it might be a staple hanging around and it would work well with the tomatoes. And, while the dish looks completely wild, it actually kind of works. The chicken holds it own against the tomatoes and olives. 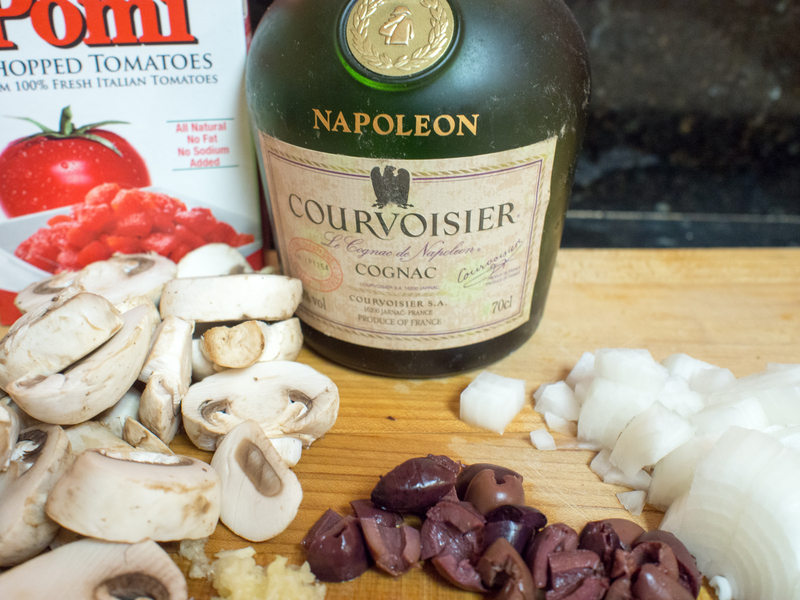 The cognac gives the tomatoes and olives a subtle depth of flavor. White wine would bring a brighter flavor, but this is more round. 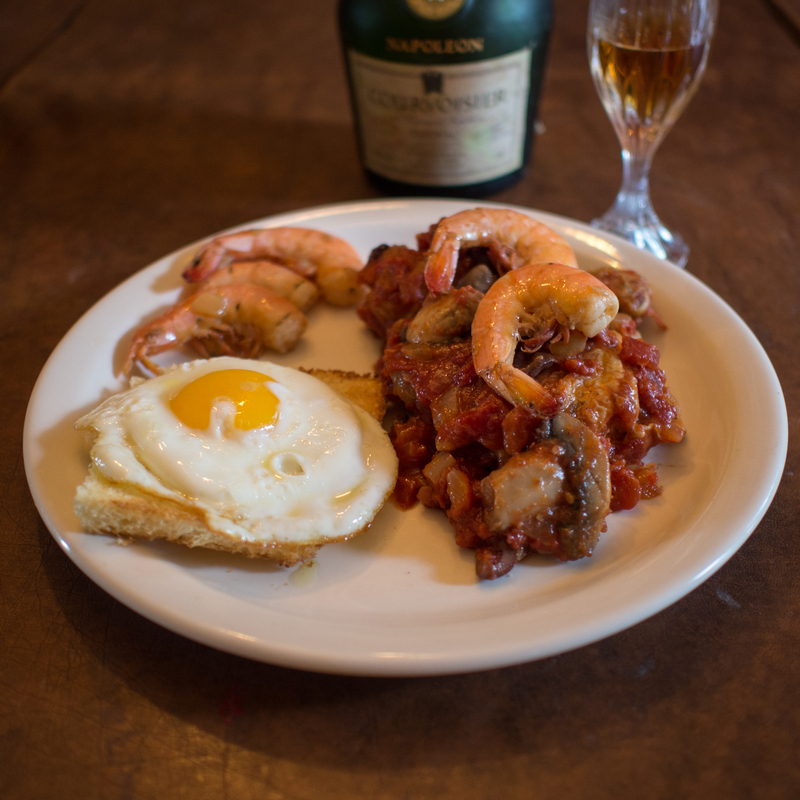 Shrimp is pretty much always good, and the eggs on fried bread is just amazing. You can imagine this dish is a victory dish. Chicken Marengo is extravagant in every possible way. I used chicken thighs and legs, not a whole chicken, because that’s what was on sale. But you could try cutting up a whole bird, just be aware of the cooking time differentials between the pieces. Cover bottom of a 3 quart of larger saute pan with olive oil. 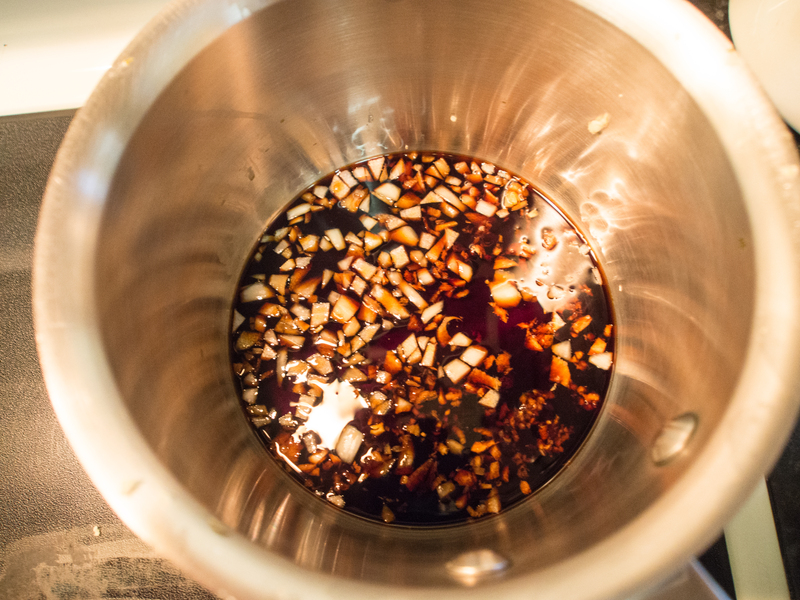 Slowly heat the oil over medium to medium high heat. 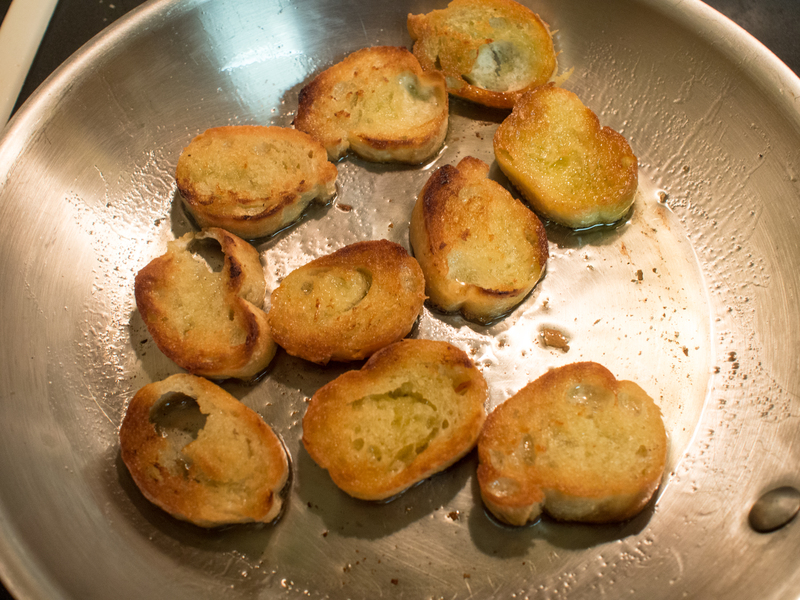 Meanwhile, cover the bottom of a small fry pan with olive oil and heat over medium high heat. Add the bread and “fry”. When golden on both sides, remove from the pan. Add more oil (or switch to a non-stick pan) and fry an egg for each person. Assembly was alleged to be: chicken, covered with tomato sauce, topped with shrimp (crawfish). On the side, fried bread topped with a fried egg. This entry was posted in Low(er) Carb, Main Dishes, Poultry, Seafood and tagged Chicken, chicken marengo, cognac, easy chicken dish, Julia Child, napoleon bonaparte, Olives, tomatoes on June 15, 2013 by dawn of food. My daughter loves salmon. She’s 7. Won’t really eat much else. Chicken? No thanks. Steak? Nope. Pork? Why bother asking. She would have salmon 7 days a week for dinner. She eats lunch and breakfast, but dinner food is just not her thing. Unless it’s a baked potato, she’s crazy about those. But I digress. Not only does she love salmon, she’s extremely discerning. “Is this farmed or wild? I think it is farmed. It doesn’t taste like the King Salmon I really like.” This is an actual sentence from a recent dinner conversation. And no, it wasn’t wild. It was Atlantic farmed salmon because the King Salmon was $24.99 a pound and looked icky. That’s the technical term, of course. We cannot fool this girl at all. She can spot Coho or Sockeye if we try to lie and say it’s King Salmon. She loves King Salmon and wants only that. When she gets a job and can shell that kind of money out, she can get it. For now, it’s whatever is cheaper with Wild being preferred. On the other end of my dinner table are my husband and 10 year old son. My husband hates fish. Mainly because he has texture issues. He can’t handle rare beef and I think the texture of the fish is too much. He’s good if it is overcooked to the point of dry though, which is not to anyone else’s liking, of course. My son really doesn’t like salmon. He’s more of a white fish kid. Loves monkfish, tilapia, hake, and cod. We all also like swordfish, but because of mercury concerns don’t really count that anymore. So, how to bridge the two? Salmon is a really health fish. It’s very versatile. My daughter isn’t about versatile. She loves it prepared one way. The way Julia Child taught me, which is as close to “plain” as it comes. Kind of poached. And that’s it. So I had to find a way to make the fish appealing to her and to my boys. The only compromise I could think of was adding a sauce to the salmon. And Salmon two ways was born. Now, there are no hard and fast measuring rules here. Use what you have. Really. 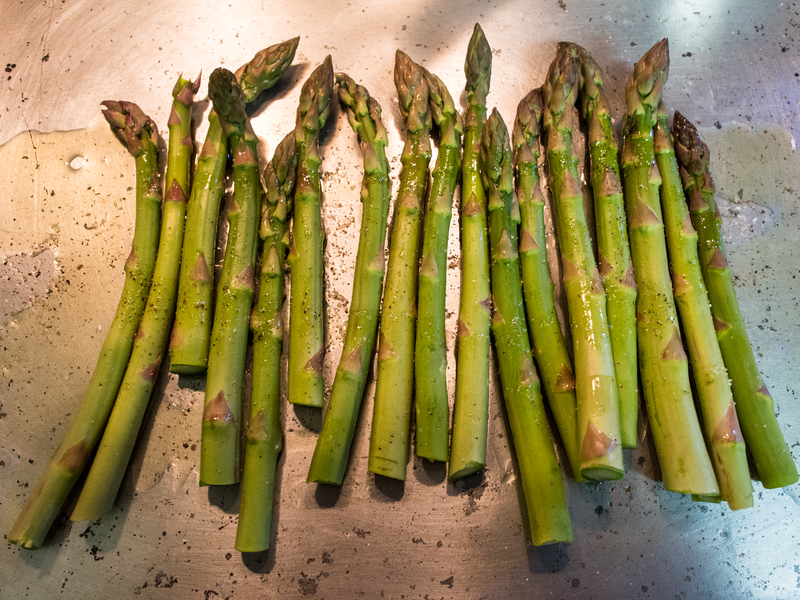 I served this with roasted asparagus. Super quick weeknight meal! Place onion, carrots and celery on a baking sheet. 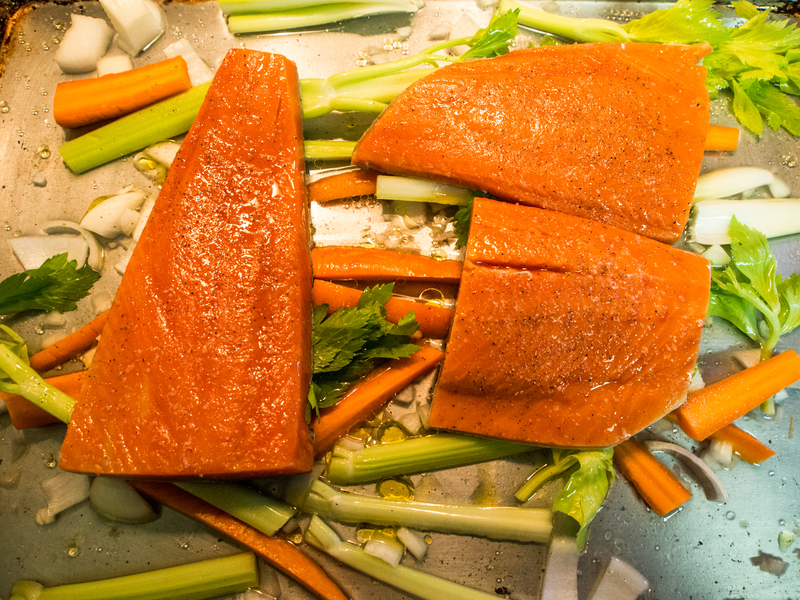 Place salmon on top of vegetables. Cover lightly with oil and salt and pepper. Fill baking pan with enough water to cover the bottom of the pan. You want enough water to survive a 20 minute ride through a 350 degree oven. Poach until just cooked though, about 20-25 minutes. About 10 minutes before the salmon is finished cooking, prepare the Ginger Soy Sauce by combining all the ingredients, whisk together and simmer until the Salmon is done. Stir occasionally. Top salmon with the sauce for those that want it, leave the salmon plain for those that don’t! 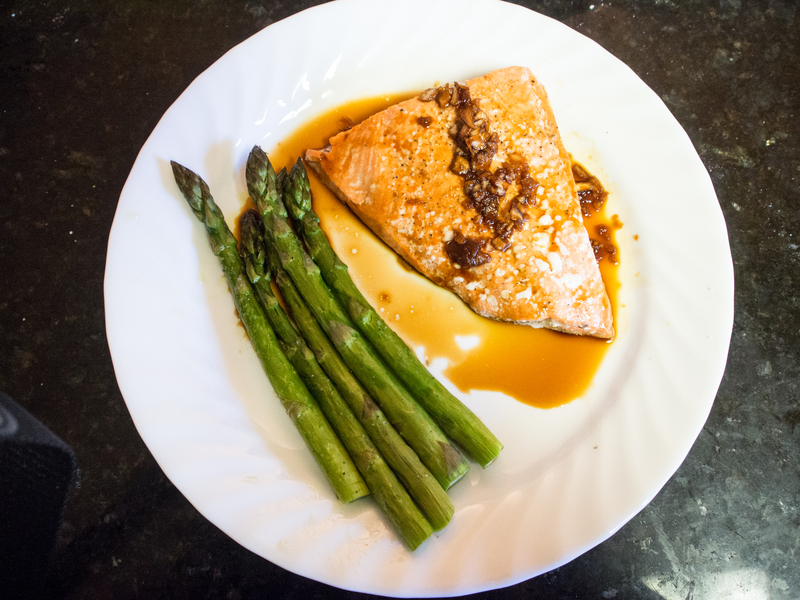 This entry was posted in Main Dishes, Seafood and tagged Coho salmon, Ginger, Julia Child, Salmon, Soy sauce on April 15, 2013 by dawn of food.